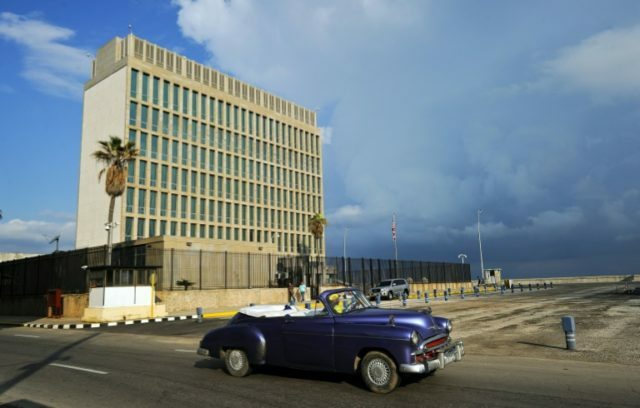 Havana (AFP) – Months of investigations into so-called sonic attacks on American diplomats in Cuba, which have soured Washington-Havana relations for most of the past year, have turned up nothing. In a saga seemingly ripped from the pages of a Cold War spy novel, at least 21 US officials and a smaller number of Canadians have received treatment for a variety of symptoms including brain trauma and hearing loss. Questions linger over whether they are the result of targeted attacks, sabotage, or an accident. Suspicions were first aroused in late 2016, but Washington waited until August 2017 to announce that several of its embassy employees had fallen victim to mystery health problems that remain unexplained. US officials have told reporters they believe some kind of inaudible sound weapon was used on its staff either inside or outside their residences in Havana. The labor union representing US diplomats said their diagnoses of those treated included mild traumatic brain injury and permanent hearing loss. On September 14, the number of employees affected was 21, with the latest incident being reported last month, US officials said, adding that monitoring of their staff in Havana was ongoing. A source close to the Canadian embassy told AFP that more than five families had been affected, including several children, but that none of those cases appeared to be serious. Washington expelled two Cuban diplomats in May and Tillerson raised the possibility of closing the US mission. Using an inaudible sound device for a stealth attack “is quite plausible from a technical point of view,” said Denis Bedat, a specialist in bio-electromagnetics. “Ultrasonic waves, beyond the acoustic capacity of humans, can be broadcast with an amplifier, and the device does not need to be large, or used inside or outside a house,” the French expert said. He cited the example of the Active Denial System (ADS), an anti-riot gun used by US police forces that pulses out electromagnetic waves that produces a sudden unbearable burning sensation. It is unclear who would have carried out such an attack, and for what ends. Numerous observers doubt that Cuba would risk antagonizing its neighbors at the end of 2016 — when relations between the former Cold War enemies were thawing, before they deteriorated under President Donald Trump. Likewise Canada, the biggest source of big-spending tourists to Cuba. According to Canadian diplomats, Ottawa does not suspect senior Cuban officials of involvement. Rumors are rife on both sides of the Florida Strait, including a plot by rogue Cuban agents aiming to derail rapprochement with Washington. Others suspect a third country with the same aims, such as Russia or North Korea. Several experts undermine that view however, saying eavesdropping systems are typically receptors, and not emitters, of signals. And, according to US media, investigators have turned up nothing suspicious in meticulous searches of the victims’ residences. “We have no definitive answer on the origin or the cause of the incidents,” a State Department official said on Tuesday. Havana meanwhile said that it had taken additional measures to protect American diplomats and their families.